Division One North was dominated by three teams, so it’s no surprise to see their sign-callers take our three podium places! Here’s how the top 3 ended up! If you put Luca and teammate Caleb Cockrill‘s output together, you would have given a stiff challenge to our top QB in the North. We’re sure Luca will be more than happy with promotion and the top seed from the MEC for the Honey Badgers though, as his excellent year saw him throw for 48 TDs, throwing only 6 interceptions. Lewis finishes the season as the second top QB in the North, but managed to throw for more scores than our top gunslinger. 65 TDs was his recorded total, however some additional interceptions and sacks cost him in the end. Despite missing some time this season, Lewis cemented himself as a QB to be feared, regardless of where the Revolution are playing next season! 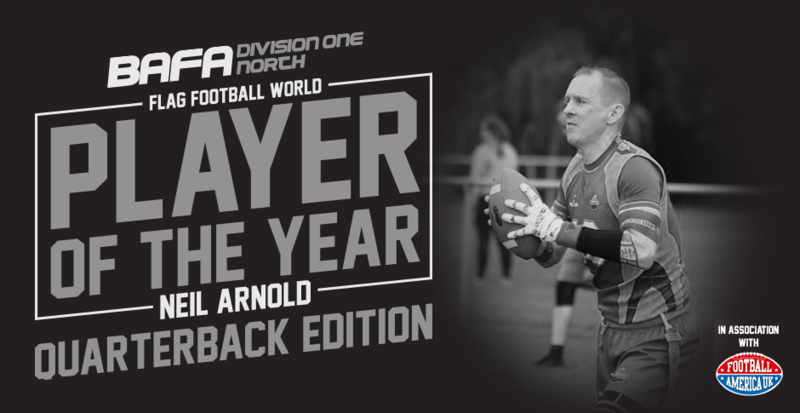 In partnership with our friends at Football America, the one stop shop for all things American Football, Neil will receive a custom hoodie for his efforts!